Our current ANS featured article is titled Health Care Experiences of Lesbian Women: A Metasynthesis authored by Marianne Snyder PhD, MSN, RN. Her metasynthesis offers insights that can assist nurses in providing sensitive and appropriate care for lesbian women. This article is also our current continuing education offering, providing nurses in all area of practice an opportunity to explore the important issues raised here, and demonstrate understanding of these issues. Despite the increasing awareness about the health disparities among lesbian women, many in this population continue to encounter discrimination in healthcare settings. We know from the literature that many lesbian women delay seeking preventative healthcare service based on previous negative encounters with a healthcare provider. This metasynthesis addresses the healthcare experiences of lesbian women as explicated across 14 qualitative studies. This study resulted in four overarching themes about lesbian women’s perceptions that emerge during a healthcare encounter. Lesbians cautiously navigate a healthcare visit by listening to the provider for statements based on heteronormative assumptions, responses to the women who voluntarily disclose their sexual orientation or have a partner who accompanies them to the visit. A broader understanding of the factors that contribute to positive and negative experiences among these women can benefit current and future healthcare providers who strive to provide more culturally sensitive and affirming care. Lesbian women perceive providers who demonstrate a welcoming and affirming presence when communicating and caring more positively. 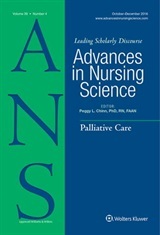 On December 18, 2018, Margaret Ann Newman, prolific nurse author, teacher and theorist, passed over to the great beyond. Margaret authored several notable articles in ANS, was frequently cited in ANS and other journals, and she was a dedicated supporter of ANS since the founding of the journal. Her writings expanded the nursology horizon over the past 40 years with her thought-provoking work. She advanced the knowledge of the discipline of nursing, and has been a key figure in the development of nursing theory. Margaret was born on born on October 10, 1933 in Memphis. She received a BA degree from Baylor University. After college she returned to Memphis to care for her mother, who had Amyotrophic Lateral Sclerosis (Lou Gerig’s disease). Having learned from her mother that one can be healthy even in the face of disease, Margaret felt a call to nursing and entered nursing school at the University of Tennessee College of Nursing. After receiving her baccalaureate nursing degree, she entered graduate nursing studies at the University of California, San Francisco and received her master’s degree in 1964. Margaret returned to Memphis and served as UT Assistant Professor of Nursing and the UT Clinical Research Center Director of Nursing. Margaret spent the next 10 years at New York University—first in doctoral studies, receiving her PhD in 1971, and then as faculty. Dr. Newman assumed the position of Professor in charge of Graduate Studies in Nursing at Penn State in 1977, at which time she also organized an international nursing theory think tank. She introduced her theory of health as expanding consciousness in 1978 and published the earliest primer on developing nursing theory: Theory Development in Nursing (1979). In 1984, she assumed a position as nurse theorist and professor at the University of Minnesota, where she furthered the development and testing of her theory, working closely with doctoral students. In the 1980s, she served as a civilian consultant to the U.S. Surgeon General for Nursing Research. Dr. Newman retired from teaching in 1999, yet remained active for another 17 years advancing nursing theory, education, research, and practice through her presentations and publications, including her 7th book, Transforming Presence: the Difference that Nursing Makes (2008). Dr. Newman’s theory of health has been widely embraced around the world and her life will be commemorated in many countries.